When I was a kid, we had a magic green scooter that stayed in this corner of our yard outside my parents’ bedroom window. It was a place of much imagination. 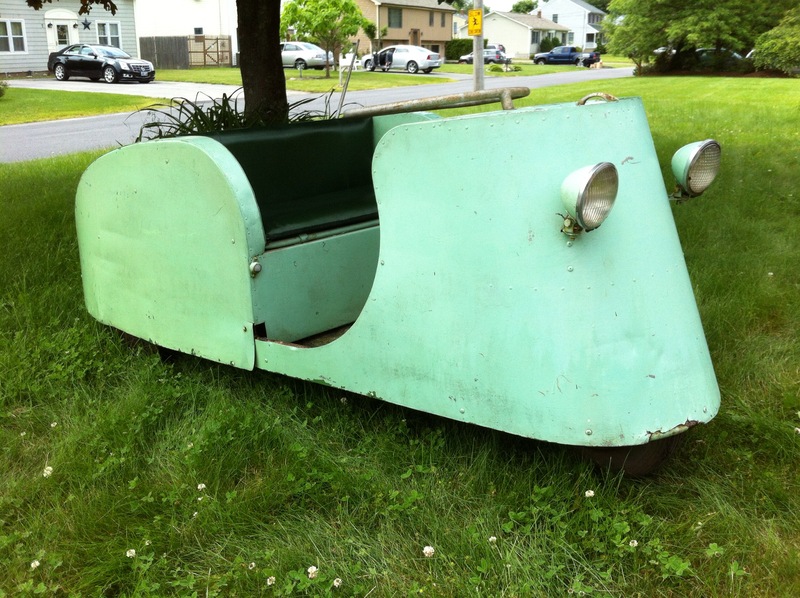 My brother, sister, and I would climb on it with some of the neighbor kids, pretend to flash the lights, pretend to steer, pretend it was an airplane, a space ship, a hovercraft, or any other sort of enchanted conveyance we could dream up. We took many trips without ever moving an inch. Or it was a convenient place to sit and watch the other kids play tetherball. Or it was a convenient base for tag. Every summer, my dad would work on the engine. When I got older, I got to help him gap the spark plug, clean the connections, clean the carburetor, lubricate the cylinders, change the oil, then crank the engine until it would cough into action. The engine had a small glass bulb gas reservoir that fascinated me. Though the scooter sat outside all winter (in the fall my dad winterized it), he always got it running. Then we’d go for trips around the yard, and sometimes down the alley to the little city park down the block. Everyone got a ride, though our dog, Hector, probably didn’t ever sit still long enough to qualify as a passenger. I remember one photograph of my grandma and grandpa riding the scooter, though I don’t recall whether they actually took it for a spin or only sat in it to pose for the picture. Now and then us kids even got to drive, and I remember once or twice someone, maybe even my dad, taking a left turn a little too sharply, causing the scooter to tip up on its side. It never flipped over, but would come to rest on the bottom of the frame, and could easily be pushed back on all three wheels. One summer, we gave it a fresh paint job and a new cover for the seat. I decorated the scooter with bunting, attached a few little flags, got a big bag of candy to throw, and drove it in the Fourth of July parade. Since my dad had kept the motorcycle license current, I was able to drive it on the street, even though I wasn’t old enough to drive a car. I was only allowed to go under 20 miles an hour and take it to, from, and along the parade route. I had a blast, driving my dad’s antique motor scooter. 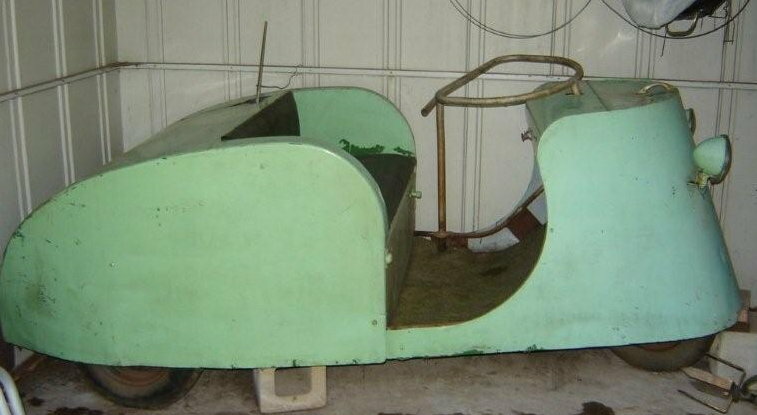 And that’s probably when I learned that it was a 1946 Motorette. My dad bought it after getting out of the Navy after WWII and after he had rehabilitated from polio that he contracted on a trip to Chicago. He went to Des Moines to attend Drake University and go to law school, and he needed a cheap vehicle that could make it around campus and up and down the hills. The Motorette fit the bill exactly, or almost. He had a hand control added that would allow him to use the brake and the gas, and he modified the back end to add a Model A transmission. The Motorette’s Mercury Clutch was perfect, since it didn’t require a pedal. With the new transmission, he had more gears and could go in reverse. He also could shift gears using the gear shift lever that stuck out the back behind the driver’s seat — not real handy if you had to change gears a lot, but perfectly acceptable for his needs. Later, he when he had moved to Osage and owned a home, he modified it slightly again so he could pull a lawn mower behind it, though by the time I was old enough to remember, us kids were the more reliable lawn mowers in the family, and the scooter was in semi-retirement, only brought out for the occasional rides around the yard. Sometime after my famous ride in the parade, we stopped starting the scooter in the summers. Eventually, it got stored in our garden shed, where it has remained for the past 20 years or more, protected from the elements and up on blocks. 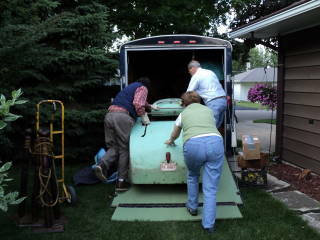 If I were more of a mechanic, like my dad, I would dream of getting the engine running again and taking it for a spin.